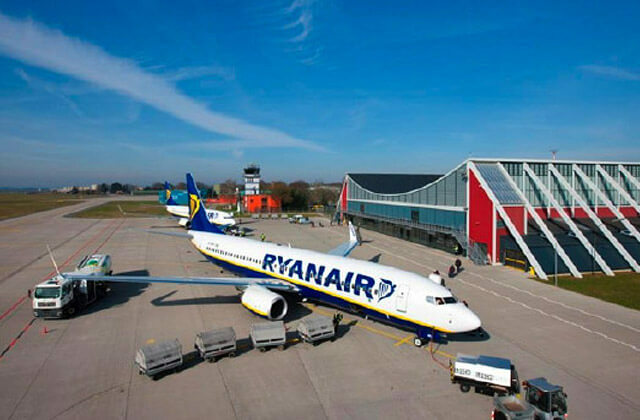 Now serving 31 international flight destinations with 6 airlines, which include the low cost carriers Ryanair, WizzAir and Flybe, the smallest airport in Bavaria has grown immensely over the past years. Currently, passengers can fly from Memmingen Airport to popular holiday destinations, such as Mallorca, Crete, Naples, Rome, Vienna, Venice and Antalya as well as Germany’s metropolises Hamburg and Berlin. Having achieved the second best results of the company’s history, Allgäu Airport has recently taken stock of the past fiscal year 2015. The prognosis of 860,000 passengers per year was exceeded with 883,490 passengers in 2015. Compared to the previous year, this means an increase by 17.8 per cent. 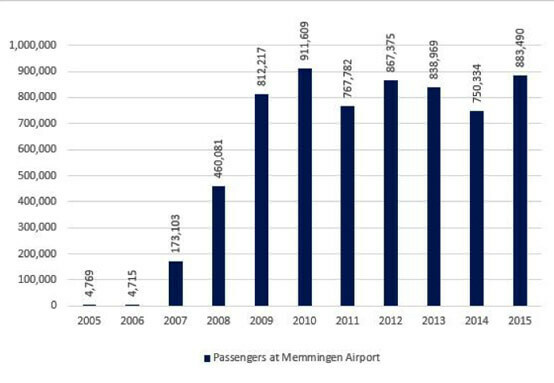 Below, a vast increase of passenger volume especially from 2009, is shown in a bar chart. Looking4Parking.com already manages successful partnerships with international airports in London Gatwick, Amsterdam Schiphol, Manchester, Nice, Edinburgh, Birmingham, Belfast and many others. Since the beginning of the new partnership with Allgäu Airport from the end of January, the Budget Parking Terminal P4 is available to customers of Looking4Parking.com. Customers who travel frequently and drive to the airport with their own car, often find searching for parking at the airport frustrating, as it can be very expensive and time-consuming. By making advance bookings for airport parking, customers have the advantages of having secured a parking space at their preferred parking terminal, parking directly on site at the airport and also saving money by comparing the onsite airport parking to external offsite Park & Ride and Meet & Greet parking services. Booking the Budget Parking Terminal P4 on Looking4Parking.com allows customers to reserve a parking space directly at the airport at low prices. With this parking option, no shuttle transfers are needed and the customers can go to their check-in gate within minutes. The parking area of Memmingen Airport underlies strict security standards and is secured with gates, lighted and there are regular controls by the police, security guards and staff. On this comparison and booking website, Looking4Parking.com, customers can compare parking offers at international airports within seconds and can make a decision based on the proximity, price and availability during their flight dates and times. The time factor is especially crucial for onsite airport parking, as flight passengers can save about 45 minutes per arrival and return journey.